What Do Employers Accomplish With a Hiring Freeze? Sometimes, even the most successful company experiences a downturn. Perhaps a new product launch has failed to produce the desired customer base, or revenues are down because the rent for your manufacturing facility just tripled. In such a scenario, it may become necessary to implement a hiring freeze. During a hiring freeze, an employer decides to stop hiring employees for all non-essential positions. It allows an employer to consolidate current employees and potentially restructure departments to complete the work that is essential for serving the customers of the business. Even during a hiring freeze, smart employers continue to strategically hire in areas where skills and talent are essential to ensure the successful run of the business, and in areas that generate revenue. Usually, these essential employees are consultants or freelancers who work hourly, daily, or weekly and are not paid benefits and have short-term contracts. 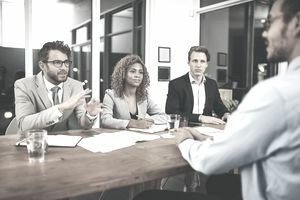 During a hiring freeze, research and development, administrative support, training, and recruitment are key areas that may need to be placed on hold for the short term with no new hires. Of course, if you own a car dealership and it's your busy season, you may need to hire an extra salesperson or two–on a freelance basis, of course. Another component of a hiring freeze is to put off filling positions that are vacated during the freeze if they are not deemed essential to carrying out the core business. A hiring freeze, which is normally implemented to cut business costs, or to right size the business, is a less dramatic alternative to employee layoffs. Employers should consider that a hiring freeze can affect current employees in negative ways. Due to a slim staff, employees may be required to take on more work or responsibility. They may also need to perform critical steps in work processes when you're not able to fill a vacant position due to a hiring freeze. The majority of your employees will be willing to work with you to accomplish unfilled jobs and job duties, as long as they know, there is an endpoint. Believing that the additional workload is permanent will negatively affect employee morale at a critical point for the business–when you need help and understanding from your employees the most. It is when it becomes incumbent upon you to communicate with your employees and let them know that their jobs, and livelihood, is secure. During a hiring freeze, employers should restrain their managers from adding additional staff in ways chosen to get around the freeze. These workaround situations include such actions as adding temporary or contingent staff, hiring part-time employees with no benefits, and hiring interns. It is crucial because your regular employees will see through the managers' ploys and the need for the hiring freeze will then become questioned, and employees will resent having to take on more work, without the benefit of more pay. Implementing a hiring freeze is nothing to be ashamed of and does not spell failure on your part. It is a stop-gap measure to ensure the success of your operation while retaining your most valued and essential employees.